The first “Kashmiri Pandit Youth Sammelan” was organized by Vivekananda Kendra, Kanyakumari - Shree Rama Krishan Mahasammelan Ashram (SRMA), Nagdandi Anantnag, Kashmir. 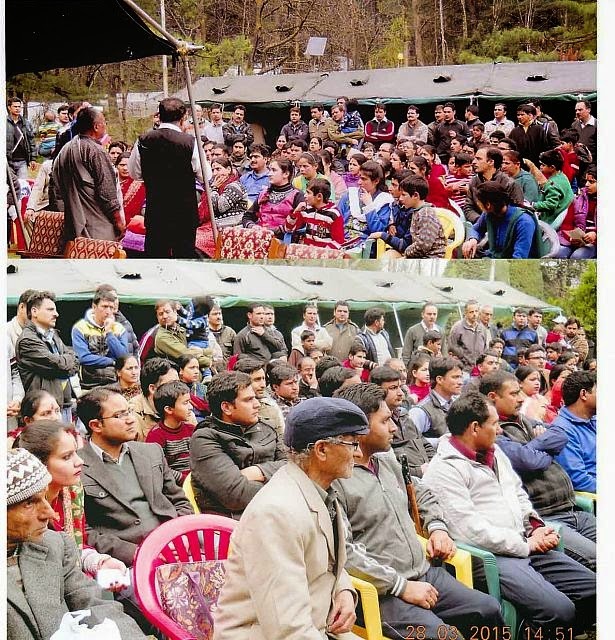 The impressive largely attended meet of devotees particularly hundreds of Community Youth working in Valley from Sheikhpora Budgam, Srinagar, Pulwama ,Monghama, Tumlahal, Drassu, Muran, Tahab , Ladeb, Koil, Hall, Shopian , Kulgam, Devsar, Aidgen, Vessu, Dialagam, Mattan, Saller , Wulrama, Akura, Laisar, Mahand , Khirhama, Charigam, Logripora, Lajura, Seer, Hutmurah , Anantnag , Uttrsoo,Nowgam, Pinglana ,Chandrigam, Bomzoi, Choudharigund and other areas was warmly addressed by Mr. B.L.Bhat Chairman Administrative Committee, “SRMA”, Nagdandi. The Ashram he explained was founded by Swami Ashokanand Ji Maharaj during 1937 to Preserve , Promote and Propagate “Sanatan Dharma”, the basics of which are Tolerance, non-violence, Humility, Pridelessness,Simplicity, Steadyness , Self control and cleanliness. He advised the youth to remain united , get inspiration from deeds of great souls like Swami Vivekananda, Mananyee Eknathji,and Swami Ashokanand Ji towards fulfilling the “Spiritually Oriented Service Mission” of Man Making and Nation Building. Being “Ambassadors and Front Runners of the Community” working under all odds in valley he advised them to additionally work towards revival of “Old Kashmiriyat” in close cooperation with the local majority community youth who had assembled in large numbers along with other members of the local populase to welcome and greet them. He requested the District Administration of Anantnag, Kulgam,Shopian, Pulwama, Budgam and other districts to be responsive in mitigating the problems of the Kashmiri Pandits presently living in valley for provision of basic amenities viz. Sanitation , Electricity, water and essential supplies besides proper security as per their desired requirements. The meeting was also attended by Mr. R.L.Teng, Mr P.N.Raina, R.L.Pandita, Mr.Satish Bhat, Mr. J.K.Razdan, Mr.B.K.Raina , Mr.M.K.Kak, Mr.Bal Ji Raina, Mr.Aditya Pandita, Mr.P.L.Raina, Mr.Girdhari Lal Bhan Senior VK Life workers Mr. Atul Saha and Kumari Lalita Ji who thanked the youth for participation and remaining connected to Roots.